Combined Insurance employees participate at the American Cancer Society's Walk and Roll. CHICAGO, April 27, 2018 /PRNewswire/ -- April is National Cancer Control Month – a month-long observance to help increase awareness for what Americans can do to prevent and control cancer. 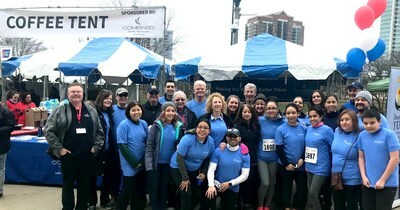 In support of this observance and for the third year in a row, Combined Insurance, a leading provider of individual supplemental accident & health, disability, and life insurance products, and a Chubb company, proudly sponsored the American Cancer Society's 2018 Walk and Roll Chicago this past Saturday. More than 4,000 walkers, runners, skaters, cyclists, and volunteers came together on Saturday morning to honor cancer survivors and caregivers, raise awareness about reducing cancer risk, and raise money to support lifesaving research and other programs and services provided by the American Cancer Society. More than 25 Combined Insurance employees and family members participated in and volunteered at Saturday's event, including Kevin Goulding, President of Combined Insurance, and Ken McIntyre, Senior Vice President of North America Operations at Combined Insurance. "We are proud to continue to support the work and mission of the American Cancer Society through this sponsorship and volunteer event," Goulding said. "Giving back to the communities where we live and work in an effort to make the world a better place is a legacy of our company started by our philanthropic founder, W. Clement Stone. We look forward to continued partnership with the American Cancer Society to help find a cure for cancer." Throughout the past three years of participation, the company has donated and raised more than $15,000 for the organization. "The Combined Insurance team shares our commitment to beating all cancers, for all ages, and we greatly appreciate their sponsorship and participation in Walk & Roll Chicago," said Peter J. Steele, Illinois Executive Director of the American Cancer Society. "We're pleased that they have been making this 'party with a purpose' an annual tradition for three years running, and look forward to seeing everyone again next year." Combined Insurance offers cancer-specific supplemental insurance policies to consumers. The company has a tradition of success in the insurance industry dating back nearly 100 years and honors Stone's commitment of giving back with volunteer efforts and donations to charitable organizations throughout the year, with special focus on health-focused, Latino and veteran charities. To learn more about Combined Insurance, visit combinedinsurance.com. Combined Insurance Company of America (Chicago, Ill.) is a leading provider of individual supplemental accident & health, disability, and life insurance products and a Chubb company. With a tradition of nearly 100 years of success, Combined Insurance is committed to making the world of supplemental insurance easy to understand. The company has an A+ rating by the Better Business Bureau and is one of Ward's Top 50® Performing Life-Health Insurance Companies. Combined Insurance is also a 2018 Top 10 Military Friendly® Employer named by G.I. Jobs Magazine—marking the seventh consecutive year on the Top 10 employer list and fourth consecutive year in the Top 5. For more information, please visit combinedinsurance.com.